Here are some facts about James Watt. 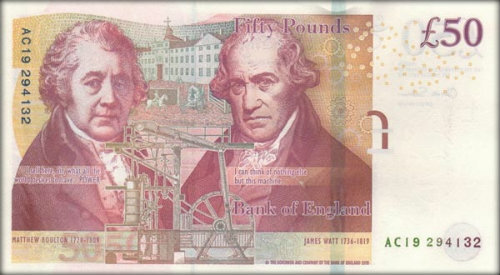 James Watt was a Scottish engineer and inventor and one of the most important contributors to the Industrial Revolution. He is best known for making major improvements to the steam engine. Watt was born in Greenock, Scotland in 1736. He was good at engineering and mathematics and on leaving school he made and repaired scientific and astronomical instruments. In the late 1750s he began to experiment with steam, even though he had never seen a working steam engine. In 1769 he took out a patent for a new condensing chamber. Watt built a steam engine which used 75 percent less fuel than previous models. It was first used to pump water from mines and then replaced all other steam engines. In the late 1760s, Watt worked with the inventor John Roebuck and then an engineer, Matthew Boulton. They made steam engines for canals, coal mines and paper, cotton and flour mills. Watt became very rich and continued to invent things, including a working machine for copying medallions and sculptures. He died in Birmingham in 1819 and he is buried in St. Mary’s Church. In 1784 he was invited to join the Royal Society of Edinburgh and in 2011 was inducted to the Scottish Engineering Hall of Fame. He appeared on a £50 note in 2011, one of only two Scots to do so. James Watt also worked as a civil engineer and is considered to be one of the earliest entrepreneurs. He made several important surveys of Britain’s canal network. The watt was named after James Watt. Today it is still used as the basic unit of mechanical and electrical power, for light bulbs and other machines. There are statues of James Watt in Manchester, Leeds, Birmingham and Glasgow, and several streets are named after him in Greenock. His workshop and its contents can be seen in the Science Museum, London. There is also the James Watt College named after him in Greenock and of course the weatherspoons James Watt Bar where the james watt college students drink on they’re lunch breaks!